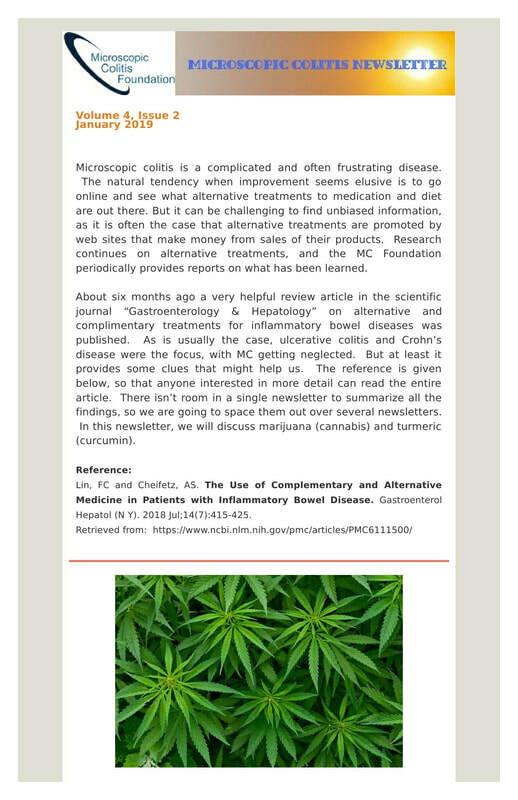 The Microscopic Colitis Foundation Newsletter is emailed quarterly to subscribers. There is no charge to subscribe. The first issue was published on October 1, 2015 and additional issues will be published during the months of January, April, and July, and this publishing schedule will be continued until further notice. To sign up to have the newsletter sent to your email address whenever a new issue is published, please enter your email address and click on the "Submit" button. You can also click on the thumbnail image of the newsletter to either open or download a copy of the latest newsletter to your computer. Back issues can viewed or downloaded from the list of files below the current issue. Back Issues Can Be Downloaded From the List Below by clicking on your selection. --Is Microscopic Colitis Affected by Weather? --Should You Add BAM Medication to Your MC Treatment Plan? --Will Marijuana Ever be a Valid Treatment Option for IBD Patients? --Why Don’t I Have any Energy? --Did You Know That IBDs are Regional Diseases? --I just Started the Diet. How Long Will It Take Before I Begin To See Improvements? --What about Using Low-Dose Naltrexone (LDN) to Treat Microscopic Colitis?